Dreaming of More Space? Add a Backyard Building! Do you dream of a space dedicated to working from home (or working out), pursuing your creative passions or housing long-term visitors but can’t figure out how to fit it into your home’s square footage? Building a detached living space might be the perfect solution, and the experts at KBC Remodeling Services in Longmont can help make your dream for a backyard structure a reality! Home Office– If you work from home but find it distracting being amidst the household activity, then creating a totally separate space from the house could be the perfect solution! Having your office in the backyard also allows for a specific entrance for clients. Guest House– When grandparents or college-age kids stay for extended periods of time, conflicting lifestyles and habits can be disruptive and create tension. By having a detached space for long-term visits, a guest house will provide privacy and help keep your family dynamic positive! Art or Music Studio– Building a separate space for artistic work will help set the mood for inspiration and creativity. And if your preferred medium is a messy one, like pottery or oil painting, or if practicing your instrument is too noisy for some family members- then all the better to move it outside! Home Gym– Having a space dedicated to exercise will increase your chances of consistently working out, especially if it’s right in your own backyard! A structure that opens up to the garden would be a perfect setting for yoga, and if you prefer cardio or strength training then moving that bulky equipment out will also free up valuable space inside your home. 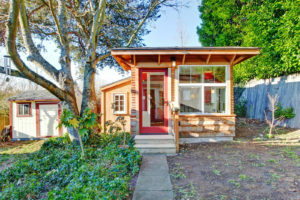 Short- or Long-term Rental– Renting out an accessory dwelling is not possible for everyone, but it is a great option for extra income to help pay the mortgage! Issues to consider include zoning laws, permit requirements, added taxes, liability concerns, and privacy factors for yourself and the neighbors. Laura Gaskill with Houzz suggests several other options for a backyard building like an in-law cottage for retired parents or a peaceful retreat just for personal rejuvenation- the sky (or, in this case, the size of your backyard) is the limit! If you are considering adding a building in your backyard, contact KBC Remodeling Service in Longmont for design inspiration, affordable construction and an impressive end result!